NB hurry, hurry – don’t miss out on free postage! 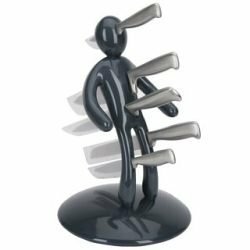 The limited edition chrome Voodoo Knife block is sure to become a collectors item. FREE SHIPPING! ON ALL VOODOO KNIFE BLOCKS! The knives are shiny and so is the knife holder. That synchronicity can only be described as perfection. The feel of cold steel in the palm of your hand will surely increase the pleasure you get from dicing, chopping and slicing you carrots – you will never be bored whilst preparing root vegetables ever, ever again. 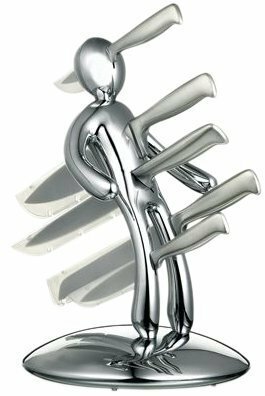 This chrome knife holder is also full of voodoo spells. They are added at the manufacturing stage to ensure they get to the very heart of the knife block; whereas other less scrupulous manufacturers of knife blocks will merely sprinkle on the voodoo right at the very last moment, just before they leave the factory – giving an entirely less satisfactory level of magic power. White voodoo for block magic!..